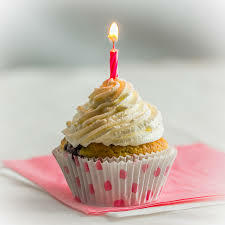 Its been a year here! Its 13 August 2014. A whole year back I joined the word press as a newbie blogger. Since then, many days i wrote the stuff, some days, i shared, too many days went blank. That’s the journey. so far. All this peace is creating new start-up plans in mind. I am a graduate so like every normal graduate i planned .. in fact, wished to have a JOB as soon as possible. I applied nearly, every where, LOL , literally, i did 😀 that’s ME .. anyways, and staying true, i tell you i still, am JOB LESS =D. so i am thinking to start up something on my own. its not because,no one replied me .. but i do have some other matters, which would definitely, be a reason of often quitting. or even if not, then could be a result of a professional failure which i DO NOT WANT, at any cost. 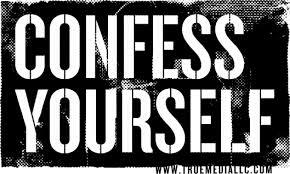 Confessions and confessions all over the Social Media .. seriously give me a BREAK!!!! Now a days, its a HOT trend om social media to say it all but all anonymously! But it looks FOOL 😛 ,that’s not the way to say how you feel to others. 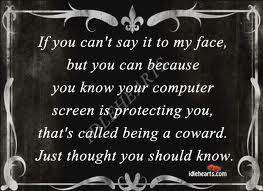 As if you can not say it in face2face conversation, then you have NO right to say it as an “UN-KnOWN” .. Believe me it do look CHEAP. then DON’T USE the -UNKNOWN- stamp , just take simple steps to approach a person , and say it all .. IF you MEAN it .. the way to approach could be any thing GENUINE, from meeting up. it’s COOL and appreciable. What’s the point in being two faced just say it to my face, not to my friends you know I will find out about it anyway! If you have noticed, I haven’t counted the TEXT messages or an EMAILS. The simplest reason behind is that, i do not trust talks on texties. as people are often, more truthful, when they speak to face. as compared to text messages. It seems LAME and FAKE to me! who the hell cares about! I believe that most things worth knowing about life can be learned from the sixteen volumes of diaries that Anaïs Nin (February 21, 1903–January 14, 1977) began keeping at the age of eleven and continued until she died at seventy-four — things that have to do withwhy emotional excess is essential to creativity,why inviting the unknown helps us live more richly, how our objects define us, personal responsibility, the elusive nature of joy,writing, and the meaning of life. 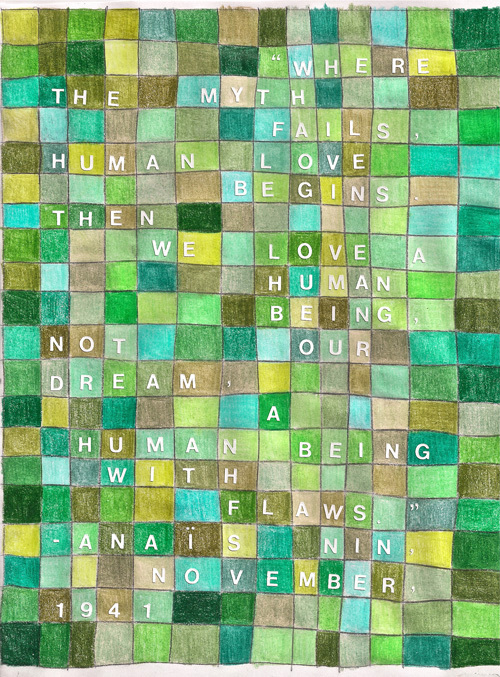 But most enchanting of all are the timeless insights on love and life that Nin — a woman who made her own rules for living as expansively as possible in a society that kept trying to contain her — spilled into the pages of her diaries. 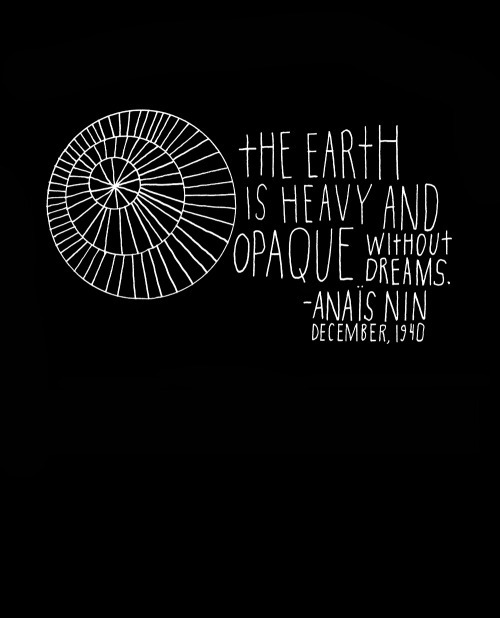 Over the past couple of years, those have come to life in a series of collaborations from the Brain Pickings artist series, as I’ve asked artists and illustrators to capture some of my favorite highlights from years of reading Nin’s diaries. 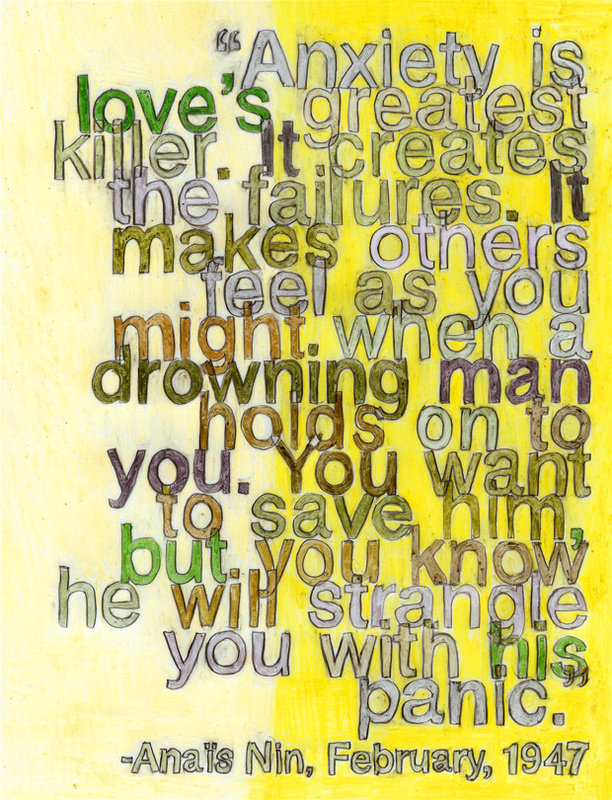 Writer, artist, and frequent collaborator Debbie Millman created a duo of hand-lettered typographic artworks based on Nin’s meditations on love. 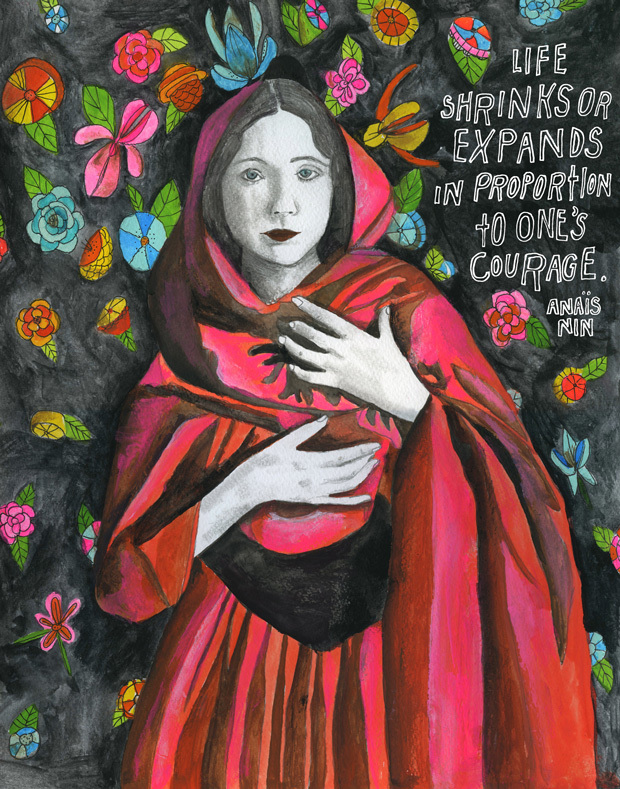 Both are available as prints here and here, with 100% of proceeds benefiting A Room of Her Own, a foundation supporting women writers and artists. 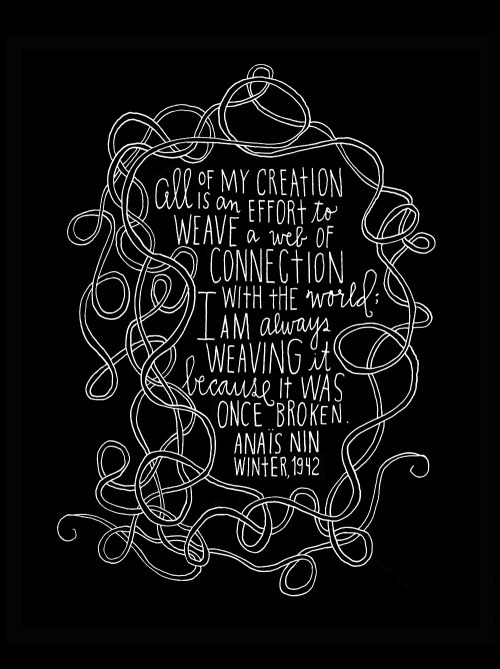 San-Francisco-based illustrator Lisa Congdon created a trio of black-and-white hand-lettered artworks based on my highlights from the third volume of Nin’s diaries. 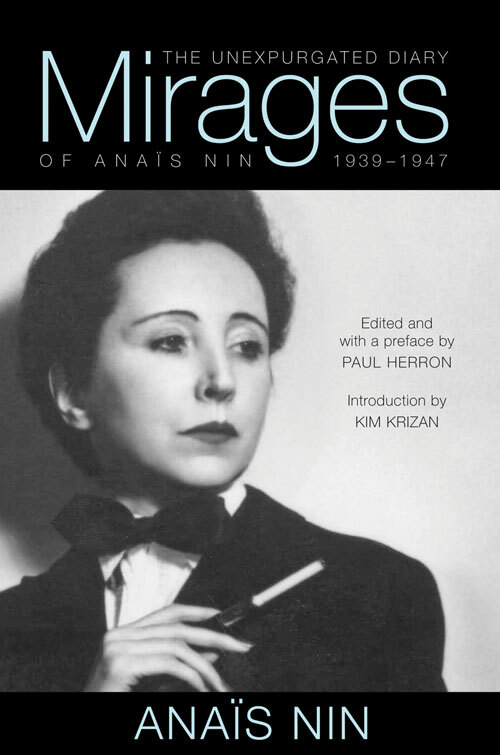 Explore more of Nin’s wisdom in the archive, including a recording of herreading from the famous diaries, then treat yourself to the recently releasedMirages: The Unexpurgated Diary of Anaïs Nin, 1939–1947 (public library). Cut out processed food from your diet. 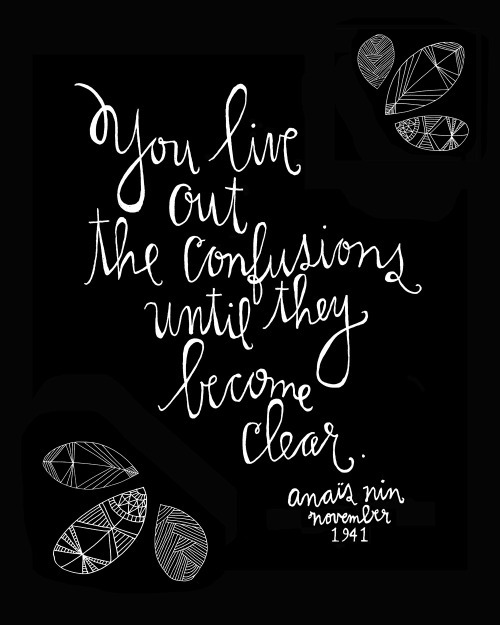 When making changes, some people (like me) prefer to go all-in and change everything at the same time. But others prefer the longer, slower approach… making small changes, one at a time. Neither approach is better than the other, it’s just that people have different personalities and like to approach lifestyle changes differently. This article is for those who prefer the longer, slower approach. It explains how to adopt a healthy, real food based diet in 12 simple, easily manageable steps. You can do one step per week, one every two weeks, or one per month… whichever suits you. Waiting until you get used to one change before making the next is a good idea. Whatever you do, you should start seeing results right away, because each step can have a powerful effect. When you’re done with this, you should have lost a significant amount of weight and improved your health, both physical and mental, in every way imaginable. Remember… habit puts willpower on autopilot. Changes in lifestyle and behavior can be tough in the beginning, but become effortless when you turn them into a habit. By mastering one small habit at a time, you will set yourself up for long-term success. Here are 12 baby steps to optimal nutrition. Before we subtract, we add. This first step will change your metabolism in a way that makes subsequent changes easier. First of all, protein actually boosts your metabolic rate… that is, how many calories you burn at rest. The studies show that high protein diets boost metabolism by 80 to 100 calories per day, compared to low protein diets (1, 2). Second of all, protein can reduce your appetite, making you automatically eat less of other calorie sources (3, 4). In one study, eating protein at 30% of calories caused an automatic reduction in calorie intake of 449 calories per day. The people lost 4.9 kg (11 lbs) in 12 weeks, without intentionally restricting anything (5). Of course… adequate protein also has many other benefits, including increased muscle mass, stronger bones, lower blood pressure, to name a few (6, 7, 8). Good protein sources include meat, poultry, fish, seafood, eggs and full-fat dairy products (if you can tolerate them). Some people like beans and legumes, which areabsolutely fine if properly prepared. I recommend eating about 1.5-2.5 grams of protein per kilogram of bodyweight, or 0.7-1.1 grams per pound. You don’t really need to weigh or measure this, but it may be a good idea to track your foods in the beginning to make sure you are getting enough. Eating more protein is the easiest, simplest and most delicious way to give your metabolism a nudge towards a lower body weight, reduced appetite and better health. It will also make the rest of the changes easier. Bottom Line: Adding more protein to your diet will boost your metabolism and reduce your appetite, giving your metabolism a nudge and making subsequent changes much easier. The second step involves changing one of your daily meals… breakfast. Most people are eating cereal or something similar for breakfast, but that really is the worst thing you can eat at the start of the day. Most breakfast cereals are loaded with refined carbs and sugar (even the healthy looking ones). Eating this stuff for breakfast will spike your blood sugar, leading to a crash a few hours later… followed by cravings for another high-carb meal (9). Instead, eat eggs for breakfast. Eggs are pretty much the perfect breakfast food… they’re high in protein, healthy fats and contain a ton of nutrients (10). There are a few studies showing that if you replace a grain-based breakfast (bagels) with eggs, it can help you lose fat (11, 12). Eggs are best served with vegetables or a fruit… but you can have quality bacon with them if you want. If you can’t eat eggs for some reason, any high-protein, nutrient dense food will suffice. There really is NO valid excuse not to eat a healthy breakfast. Once you get this into a routine, preparing an egg-based breakfast doesn’t take more than 5-10 minutes, at most. Just set your alarm a bit earlier. That being said, there is no need to eat breakfast in the morning if you don’t feel like it, just make sure that your first meal of the day is a healthy one. Bottom Line: Eating a healthy, nutrient-dense breakfast with protein and healthy fats is the best way to start the day. Simply replacing unhealthy fats and oils with healthier ones can have a major impact on your health down the line. Most people are eating a lot of seriously unhealthy fats… including trans fats and refined vegetable oils. Although trans fat consumption has gone down in the past few years and decades, it is still way too high. To avoid trans fats, make sure you read the label on anything you eat. If it says “hydrogenated” or “partially hydrogenated” anywhere on the label, avoid it. Refined vegetable oils are also problematic. They have a different composition than other more natural fats, being unnaturally high in Omega-6 fatty acids. This includes corn oil, soybean oil, cottonseed oil and several others. Without getting into the details (you can read about them here), consuming vegetable oils may be leading to increased inflammation and oxidative damage in the body, potentially raising your risk of heart disease and cancer (13, 14, 15, 16). Instead of these nasty fats and oils, choose fats that are mostly saturated and/or monounsaturated. Grass-fed butter, coconut oil, olive oil, avocado oil and others. Whole nuts are an excellent source of fat as well. Bottom Line: The relatively simple act of replacing trans fats and high Omega-6 vegetable oils with healthy, traditional fats should lead to some pretty impressive health benefits and make your body function better. Sugar is bad news… but sugar consumed in a liquid form is even worse. Studies show that the brain doesn’t “register” liquid sugar calories in the same way as it does calories from other foods (17, 18). So you might drink several hundred calories of soda in one day (not uncommon), but your brain doesn’t take them into account when it is trying to control your energy balance. If you were to add a whole food to your diet, you would automatically eat less of other foods instead. In other words, your brain would “compensate” for those added calories. That doesn’t happen with liquid sugar calories. Your brain doesn’t compensate for them, so you end up taking in more than you need. One study shows that consuming a single serving of sugar-sweetened beverages per day is linked to a 60% increased risk of obesity in children (19). Many other studies support this… sugar-sweetened beverages may be the most fattening aspect of the modern diet (20). Keep in mind that fruit juice is just as bad. It contains the same amount of sugar as a sugary soft drink (21). Bottom Line: Sugar may be the single worst ingredient in the modern diet, but consuming it in a liquid form is even worse. Exercise is one of the most important things you can do for both physical and mental health, as well as disease prevention. On its own, it is unlikely to lead to significant weight loss (22). However… it can help improve your body composition. You may not be losing weight, but you may be losing some fat and gaining a bit of muscle instead (23). Exercise leads to so many benefits that it is beyond the scope of this article to list all of them… but let’s just say that exercise is highly protective against pretty much any chronic, Western disease (24). It is also incredibly beneficial for mood, well-being and avoiding depression, which is a very common problem today (25, 26, 27). When it comes to exercise, what you do exactly is not that important. What IS important is finding something that you enjoy doing and can stick to in the long run. Although a combination of cardiovascular exercise and some type of resistance training may be the best, something as simple as walking also has incredibly powerful health benefits (28). If you’ve already done steps 1-4, the function of your hormones should have improved and your energy levels increased, so starting an exercise program may not be that hard. Work your way up to doing some sort of exercise at least 3 times per week. Bottom Line: Exercise is just as important as nutrition when it comes to optimal health. It can improve both physical and mental health, while being highly protective against most modern, chronic diseases. Time to get rid of all the “bad” carbs. Sugar and refined carbs are some of the unhealthiest aspects of the modern diet. They’re low in nutrients and fiber and contribute to overeating, which brings with it a plethora of metabolic problems and diseases (29, 30). Wheat is in a league of its own. Modern dwarf wheat, introduced around 1960, is low in nutrients compared to older varieties of wheat and is much worse for celiac patients and gluten sensitive individuals than older types of wheat (31, 32, 33). Instead of the “bad” carbs, choose healthier carb sources instead. Vegetables, fruits, potatoes, sweet potatoes, healthier grains like rice, oats and quinoa, even legumes if you can tolerate them. For now, let this suffice and don’t restrict total carb intake (not until step #8). 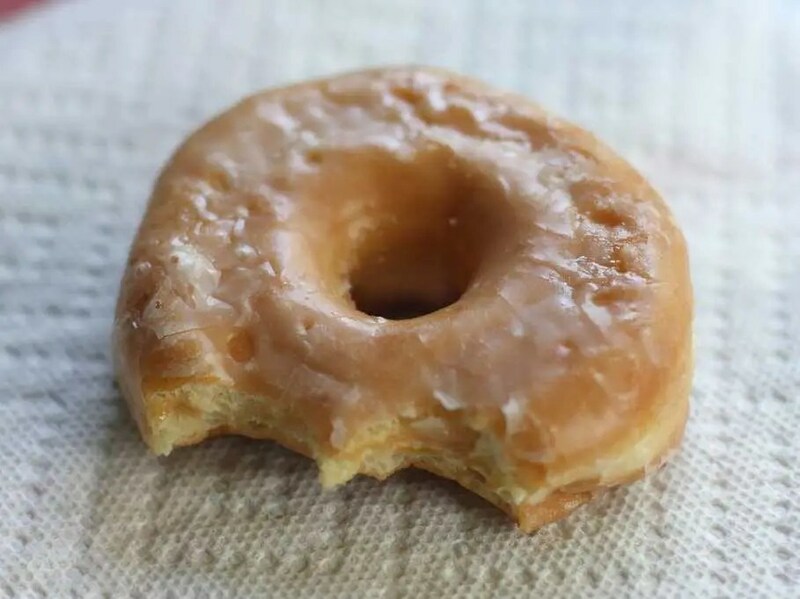 Whatever you do, just get rid of the sugar and processed carbs from your diet. Eat real food instead. Bottom Line: Sugar and refined carbs are some of the most damaging aspects of the modern diet. It’s time to get rid of them and eat healthier carbs instead. Now it’s time to transform another one of your daily meals… dinner. Replace whatever it is that you’re eating with a meal based on either meat or fish, along with plenty of nutritious vegetables. I find that dinner is the easiest meal to fit in plenty of veggies. If you enjoy starches (like potatoes or rice) with dinner, then feel free to eat those too. Definitely try to eat fatty fish at least 1-2 times per week for all the super healthy Omega-3s. If you can’t or won’t eat fatty fish, then supplement with fish oil. Bottom Line: Start eating a healthy dinner based on meat or fish, with plenty of vegetables. Try to eat fatty fish at least 1-2 times per week. Carbs are a highly controversial nutrient. Some think the biggest part of our diet should be coming from carbs, while others think they are downright toxic. As with most things, the truth is somewhere in between and depends greatly on the individual. The optimal carb intake for any one individual depends on many factors… including metabolic health, activity levels, food culture and personal preference. 100-150 grams: People who are lean, healthy and physically active (some people may need even more than this). 50-100 grams: People who are overweight and/or don’t exercise much. 20-50 grams: People who have a lot of weight to lose, or have metabolic problems like type 2 diabetes. If weight loss is your goal, you can slowly add back in healthier carb sources when you reach your ideal weight. Bottom Line: Some people function best eating plenty of carbohydrates. For others, low-carb diets have life saving benefits. It’s important to match carbohydrate intake to your individual needs and preferences. Often overlooked, sleep and stress levels can have a major effect on your health. Studies show that not getting enough sleep is strongly linked to many serious diseases, including obesity (34, 35). Short sleep duration may actually be one of the strongest risk factor for weight gain. It is linked to a 55% increased risk of obesity in adults and 89% in children (36). There are many ways to improve sleep… such as sleeping in a completely dark room, avoiding caffeine in the afternoon and evening, as well as maintaining a consistent sleep schedule. Another major lifestyle factor is chronic stress. Excess stress raises your levels of the hormone cortisol, which can make you gain a lot of fat in the abdominal cavity and raise your risk of all sorts of health problems down the line (37, 38). Unfortunately, stress can be hard to deal with. Many of us are overwhelmed with various duties and worries. Meditation can help with this, but if you are severely stressed all the time and can’t find a way to change it on your own, then it may be a good idea to seek professional help. Bottom Line: Lifestyle factors like getting adequate sleep and avoiding chronic stress are incredibly important for optimal health, but often overlooked. Now that you’ve already taken care of breakfast and dinner, it’s time to move on to lunches and snacks. These meals tend to be the most problematic for a lot of people, because they are often eaten away from home. A good way to always ensure you can eat something healthy for lunch is to cook an excessive amount at dinner, so you can eat leftovers for lunch the next day. But today, because the world is more health conscious than ever before, “fast food” places that serve healthy food have started appearing all over the place. It might be a good idea to write down a list of places that serve healthier foods, so you always have some options on hand if you find yourself hungry away from home. Snacks are pretty easy… a piece of fruit and a handful of nuts works well. A few hard boiled eggs, a bag of baby carrots… all of these are easily portable. Chances are that you won’t even need snacks at this point, since avoiding sugar and processed carbs tends to reduce hunger and lead to stable energy levels. Bottom Line: It’s time to start eating healthy lunches and snacks every day. Now each of your meals should be healthy and nutritious. It can help to plan ahead and have a list of “fast food” places that serve healthy foods. Now it’s time to go completely real food based. You should already be 90% there, but if you’ve been hanging on to anything that you think may be doing you harm, now is the time to get rid of it. Clear out your pantry… throw away all soda, bread, cereals, flour, sugars, pastries and processed foods. Start focusing on quality ingredients… look for quality sources of animal foods, choose grass-fed if you can. Eat quality produce and try to avoid any food with artificial ingredients. Remember… real food doesn’t need an ingredients list, because real food IS the ingredient. Bottom Line: It’s time to clear your house of all unhealthy, artificial stuff. Start focusing on quality, unprocessed foods at every meal. Look for the healthiest sources of plants and animals. The final step is a lifelong endeavour. Turn health and nutrition into a hobby. Subscribe to some blogs and try to read a few health related books per year. Stay health conscious for the rest of your life and you will live longer, look better and avoid most of the chronic diseases that people suffer from in old age.